ARC comes to an informal close. After three very productive years, the ARC project is now winding down. We’re delighted with the progress made by everyone on the team, and invite visitors to continue following the development of Korsakow via its website and/or its Facebook page. For any inquiries about the project, please contact Matt Soar or Monika Kin Gagnon, Dept of Communication Studies, Concordia University. The ARC site has also been relentlessly targeted by WordPress hackers over the past two years, so we’ve finally been forced to strip out the WordPress install. What you’re looking at now is a non-functional HTML site. As a consequence, while all the content remains accessible, the site is no longer being updated. An Interview with Adrian Miles as part of our ongoing series dedicated to sharing the stories and strategies of educators who have incorporated Korsakow into their teaching practice. Interview by Myriam A. Rafla. A lecture by Professor Angela McRobbie (Goldsmiths University of London) given at Concordia University on October 31, 2013. Organized by Dr Norma Rantisi (Geography, Planning and Environment) and Dr Matt Soar (Communication Studies). This lecture draws from the first chapter of Be Creative? (forthcoming) and it offers a series of reflections on creativity as a dispositif of contemporary governmentality which ‘captures’ as a play for power, young working class and lower middle class desires for self-expressive work. These desires can also be construed as dimensions of ‘labour struggle’ or lines of flight emanating from the home and inter-generational relations. The lectures re-works both Birmingham CCCS subcultural theory, and the Italian Opera theorists’ notion of ‘refusal of work’, pinpointing the ‘hipster’ figure as indicative of the full capitalisation and consequent de-politicisation of ‘youth culture’. BIOGRAPHY: Angela McRobbie began her academic career in the mid 1970s at the Centre for Contemporary Cultural Studies in Birmingham under the directorship of Stuart Hall. Her thesis on Jackie magazine was published, re-printed and translated into several languages. She is the author of books and articles on young women and popular culture, youth culture, the working lives of UK fashion designers, the sociology of the new creative economy, and feminist theory in the context of contemporary neoliberalism. Her most recent journal article is titled ‘Feminism, the Family and the New ‘Mediated’ Maternalism’. She published The Aftermath of Feminism in 2008,(the German edition, published in 2010, is a best seller) and she is currently completing Be Creative? Making a Living in the New Culture Industries (Polity 2014). McRobbie is a participant in the £5m AHRC CREAte Grant: she is investigating copyright and IP issues for young fashion designers in Berlin, Milan, Paris and London. She is a regular contributor to BBC Radio 4 Thinking Allowed, BBC Radio 4 Women’s Hour and the Guardian newspaper. McRobbie is Professor of Communications at Goldsmiths University of London. A lecture given by Professor Angela McRobbie (Goldsmiths University of London) at Concordia University on Friday, November 1st, 2013. Organized by Dr Norma Rantisi (Geography, Planning and Environment) and Dr Matt Soar (Communication Studies). This lecture offers a multiple set of perspectives on the Berlin fashion start-up scene, with particular reference to young women’s self employment strategies, the politics of urban space and the birth of a new fashion imagination through social enterprise. Email Adrian Miles if you’re coming. Bit more info at http://vogmae.net.au/vlog/2013/07/korsakow-interest-group/— at RMIT Building 9. Matt is currently on a short Korsakow tour in Australia. He has so far conducted workshops at the University of Western Sydney (sincere thanks to Hart Cohen for organizing), and at RMIT in Melbourne (huge thanks to Adrian Miles for that one). Here’s Adrian’s very generous write-up. Next up: Alice Springs! 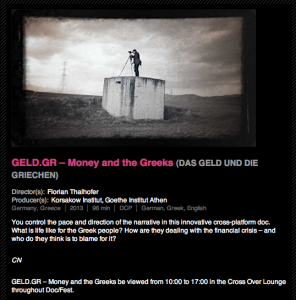 GELD.GR @ Sheffield Doc / Fest! Florian Thalhofer’s latest Web-Doc GELD.GR - MONEY AND THE GREEKS is screening at the Sheffield Doc / Fest this Saturday from 10:00 – 17:00. Join us if you can! We recently attended the HASTAC Conference 2013 (Humanities, Arts, Science, and Technology Advanced Collaboratory) at York University in Toronto organized by Caitlin Fisher and Maureen Engel. Florian, Matt, Midi, along with Mél Hogan (University of Colorado, Boulder) participated on the panel, The Korsakow System: Database Filmmaking for the Web. Florian introduced Money and the Greeks, his most recent Korsakow film, describing the ‘rating’ process he used for selecting the interviews, as well as recent screenings in Greece, Germany and Romania. Midi described her experience as a participant in the Canadian Forces Artist Program in Afghanistan, discussed the digital ‘toy cameras’ she brought with her, and shared her insight into making a K-film with limited footage. Mél Hogan presented her Dynamic Archiving project which she is currently developing with Eric Coomb using Korsakow as a tool for digital curation at the Brakhage Center for the Media Art/ s.
During the weekend, Phil, Midi and Concordia PhD student, M.E. Luka also presented their K-Films in-progress for feedback and discussion with the ARC team members. Florian’s presence was invaluable in addressing each filmmaker’s specific concerns and questions. Myriam Rafla a new PhD student in Communication Studies at Concordia was also introduced to the team. It proved to be a highly productive time. On Saturday night, the D|N|A Anthology: Seven Interactive Essays on Digital Non-Linear Narratives edited by Monika Kin Gagnon and Matt Soar was launched at the Scott Library during the HASTAC reception. D|N|A was built using Scalar, a brand new content management system for ‘multimedia scholarship’ currently under development at USC. All the essays address various non-linear multimedia forms, offering a compendium of current projects, concepts and theorizing on the topic. All in all, it was a constructive and inspirational couple of days! The first in our occasional series Korsakow in the Classroom: an insightful and inspiring interview with the wonderful Jenny Cool by our very own MA student Ryan Cadrette. September 2012 marks the launch of a brand new Korsakow film, created by ARC team co-director Matt Soar. Two years in the making, Ceci N’est Pas Embres is a ‘database diary’ about a family from Québec moving to southwest France. 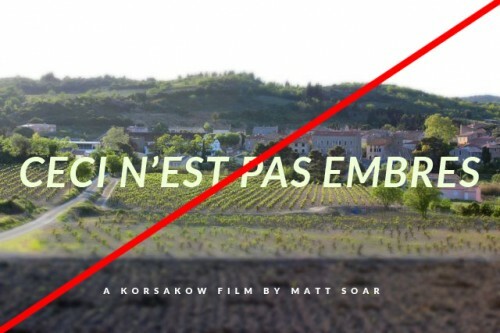 Featuring personal testimony, animated sequences, and a soundtrack composed especially for the film, Ceci N’est Pas Embres is an attempt to engage the viewer with a series of vignettes that were conceived specifically with Korsakow in mind. The film can be viewed in its entirety on a dedicated website here. ARC was currently funded by a three-year Research/Creation in the Fine Arts grant from the Social Sciences and Humanities Research Council of Canada. Welcome to the retired website for ARC (Adventures in Research/Creation), a multi-year project based at Concordia University in Montréal, and co-directed by Professors Monika Kin Gagnon and Matt Soar. This site includes all current resources and blog posts from PIP (Proof in Process, 2011 - 2014), and CINER-G (Concordia Interactive Narrative Experimentation and Research Group 2007-2011).